Q. What is an Empirical study? How do I find them? 1. What are Empirical Research Articles? Empirical Research is defined as research based on observed and measured phenomena. It is research that derives knowledge from actual experience rather than from theory or belief. Requests for "Empirical" articles are usually from instructors in Education or Psychology; most other disciplines will ask for scholarly, peer reviewed, or primary literature. Most, but not all, of these will be empirical studies. To determine if an article is an empirical study, see if the article mentions a study, an observation, an analysis or a number of participants or subjects. Was data collected, a survey or questionnaire administered, an assessment or measurement used, an interview conducted? All of these terms indicate possible methodologies used in empirical research. The sections may be combined, and may have different headings or no headings at all; however, the information that would fall within these sections should be present in an empirical article. A. PsycINFO and PsycARTICLES. After entering search terms in boxes at top of screen, scroll down to Methodology and select: Empirical Study. Note there are subsets of Empirical Study below this entry that you could use. 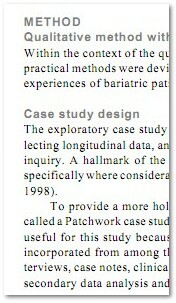 and change the pulldown to "Abstract". Look over the articles you get from searches carefully. The final determination of whether or not a particular article is empirical is a judgement that you must make. Also, some of the search devices mentioned here may not retrieve all of the Empirical articles for a given topic.